Hi Guys, I hope winter is treating you better than me. I have dry patches on my arms, my skin feel like its auditioning for "The swamp people" and my cheeks is as red as beetroot in the mornings, not to mention the bags full of extra love and care I have to put into my lips to keep them from chapping, cause once they start chapping in winter there is no going back! Its like a nightmare you cannot wake up from and that is why I firmly believe in lip scrubs - all year round. I have put two lip scrubs up against each other to see how they perform and if there is one I prefer above the other. Packaging - Sugar Plum from Lush comes in a glass pot that you can screw open and close. The packaging is nice and sturdy and I think a perfect fit for this type of product. The name is on the lid as well as on the side with the ingredients listed on the other side. 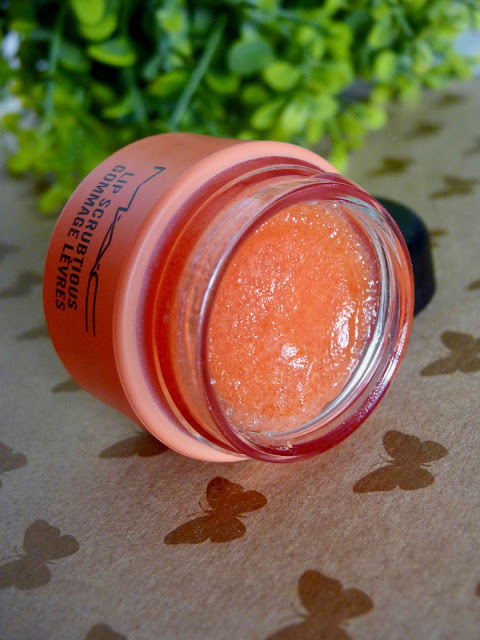 The opening of the glass pot is big enough to allow easy access to the sugar scrub. Candied Nectar also comes in similar packaging, the biggest difference is that the MAC one comes in a hard plastic tub, but it looks and feel like glass. It also has a screw on lid and the jar is the color that the scent resembles, in this instance its orange to resemble the peach flavor. I find the opening big enough just like the Lush one, but the MAC product is set a bit deeper than the Lush one, which means you have to use an earbud to scoop it out. Ingredients & Consistency - The sugar plum fairy scrub has got only 7 mostly natural ingredients. I really appreciate this fact, but that also means that you have to stick to the expiry date on the bottom of the jar. The scrub is very grainy as it is mostly sugar but this is a good thing in the sense that it works perfectly removing all the dead skins on your lips. I really enjoy using this scrub. The Candied Nectar not the other hand has got a few more ingredients and some of them are looking not so natural. Saying this, I do not mind so much as this scrub leave my lips just a bit more moisturized. I think there is more oils in this scrub as the consistency is a lot different from the sugar plum fairy. When you open the lid, you immediately get that scent and it smells glorious. The scent together with the nice oily consistency makes for a brilliant scrub, cause the sugar is still nice and grainy and the oils add some extra moisture. Performance - Both scrubs perform relatively the same, there is only small differences between them - mostly the consistency. The sugar plum fairy is more sugary / grainy and dry. I also do not mind if some of the mixture get on the inside of my mouth cause the ingredients is mostly natural. I enjoy how I can use my ring finger and pick up some of the product and use the same finger to exfoliate my lips. After I am done exfoliating my lips feel brand spanking new and I always apply some lip balm. On days where I need some more moisture and some more pampering, I enjoy the MAC scrub. Although there is loads of oils in this one, the grains used to exfoliate is still coming through. I have to be very careful with this scrub as I am not fond of the feeling of it on the inside of my mouth. With that being said, cause I use an earbud to scoop it out, I can control where I place it. The feeling afterwards is nice and exfoliated and slightly moisturized, yet I still add some lip balm. 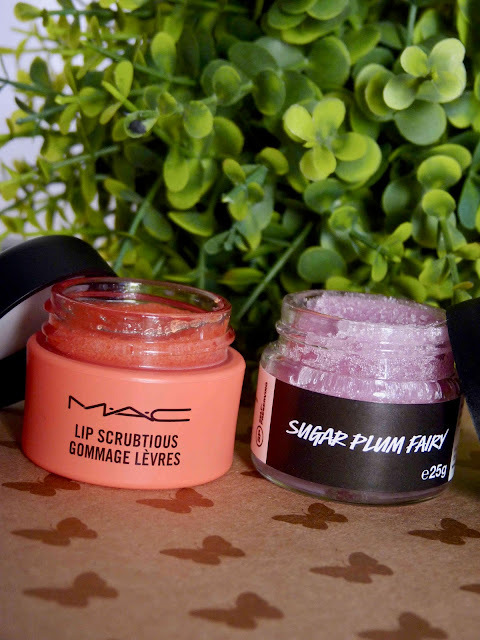 Price and availability - Lush Sugar Plum Fairy retails for R105 for 25g and the MAC scrub is going at R270 for 14ml. I am battling to compare the measurements with each other, but when I hold these jars in my hands, they feel the same size. One thing you need to keep in mind is that the Lush scrub has a shelf life of about 12 months and a little goes a LONG way. 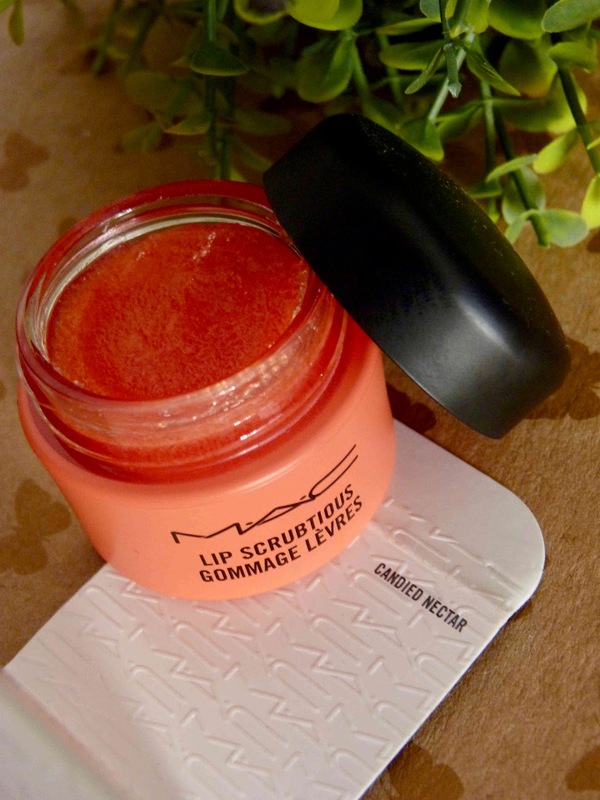 Sugar Plum Fairy is only available from the Lush stores or their online store, whereas the MAC scrub is also only available from MAC stores or online, but some Foschini and Edgars stores has got MAC counters. I can honestly not choose the one above the other as I enjoy using each one for a different reason. They both perform extremely well and they both smell amazing. It would be like choosing your favorite child??? Not possible. If you have tried any of these scrubs before, leave your thoughts in the comments below. Also leave your favorite lip scrub suggestion below.